What to do on the trip vietnam in a week? 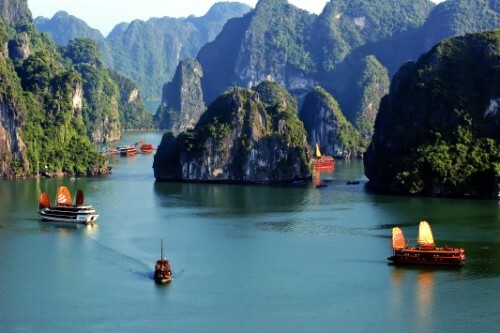 Here it is: Top destinations for Vietnam journey 7 days are stunning Ha Long bay, amazing Mekong delta and can not miss Cu Chi tunnels for this time. It has been carefully made as one of the best Vietnam tour packages from Jakarta - Indonesia, Manila - The philippines, Uk, Singapore, Australia, USA, Malaysia... Let go through the details of Vietnam Tour 1 week. Landing at Noibai airport, you is met by our local tour guide for the transfer to your hotel in Hanoi capital. Refresh for a while before tasting the real and delicious local food in Ha Noi called Food on Foot tour. 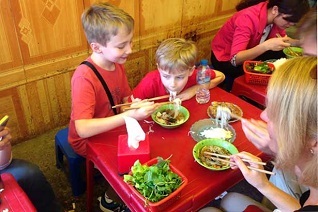 Do worry about the hygiene as our local food expert will show off with the best of the locals for the visitors to Hanoi. Overnight in Hanoi. Activity of the Journey today: Sailing, sightseeing, boat-rowing, swimming - all in the bay. 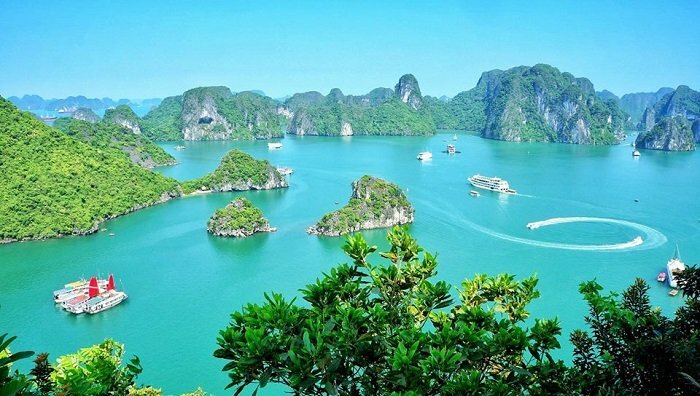 Good bye the bustling capital of Vietnam for the lifetime journey in your life with Halong bay 2 days tour overnight onboard - top of the best Vietnam journey 7 days. So big as 1553km2, Halong bay offers many routes of cruises from couple of hours to over one week. 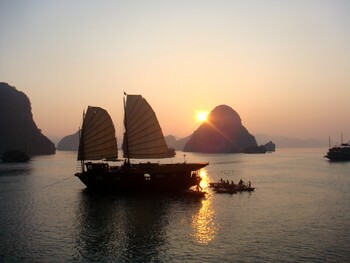 2 Day tour Halong, you will see the most beautiful part of the bay with combination of Bai Tu Long Bay and Ha Long bay. Do miss the chance for overnight onboard as it is voted as top of the best Vietnam tour one week. Cruising Halong bay to the middle of the bay, passing some floating village, seeing daily life of the fishmen create some of the nicest monment in your life. 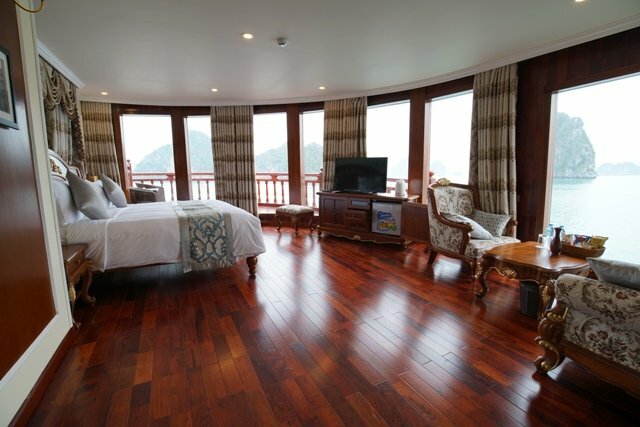 Hanoi and Saigon hotels could be standard but cruise in Halong bay should be luxury with great food and services for the lifetime experience. The Luxury also means Safety. Click to see: Boat sinking in Halong bay here. Overnight on one of the luxury cruises. Tour Halong bay in the moring with a visit to some of the most beautiful limestone cave in the world. Possibility with kayaking and then cruise Halong bay on the other side to have the whole view and understand why Halong bay have been twice voted as UNESCO Site and became one of the new 7 Natural Wonders of the World. Learn about the amazing and secret of the nature. Enjoy the brunch before your cruise head back to the pier. 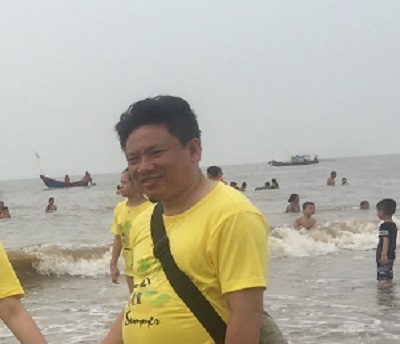 The driver of Deluxe Vietnam Tours is waiting for you at the pier for the journey back to Hanoi. Bye bye Hanoi for the flight to Ho Chi Minh City. 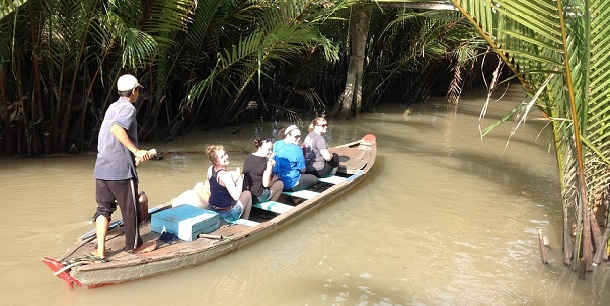 On arrival, our local guide of Deluxe Vietnam Tours will pick up you at the domestic airport for the short journey to Cu Chi tunnels of over 250 km under ground tunnels serving as home for local people. Here, you will learn a sad time in Vietnam where many people of both sides lost their fate here. Drive back to Saigon city center for check-in and overnight in the most bustling city in Vietnam. Get away from the bustling city to the lush countryside in the south Vietnam - Vinh Long province where you will join Mekong river cruise to discover the different way of life - Waterlife. Here, you will use the main and most important transportation - boat, sampan rowing by local people, see and experience floating market... Back to Saigon for overnight. Tour Ho Chi Minh city with some of the best places - Notre Dame Catholic Cathedral, Post Office and the historical Reunification Palace and ends with the War Remnants Museum. Free until transfer to Tan Son Nhat airport for flight home. Contact us for best price for your Vietnam journey. 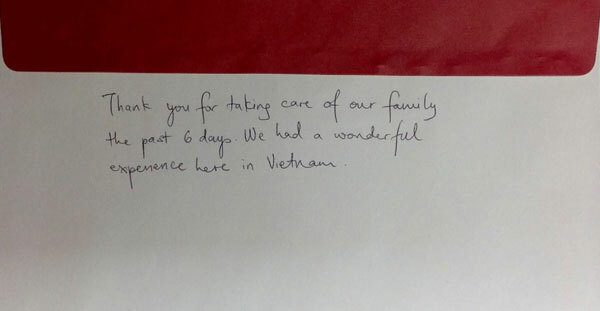 Thank you for your request for a tailor made journey to Vietnam with Deluxe Vietnam Tours. Please find my attached Vietnam itinerary suggested for you to visit Vietnam - private tour, all airport transfer and hotels at 4 star standard. I made 2 seperated Vietnam journeys which mentioned in your original request. This is because Hanoi and Saigon is very far away from eachother. 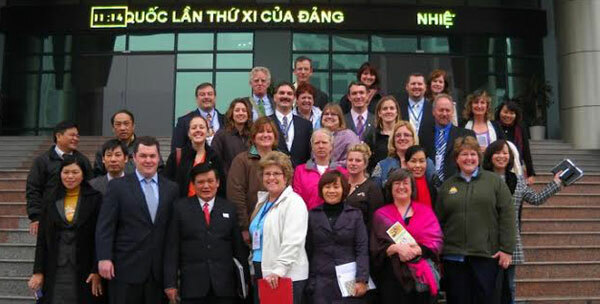 Please see this link to get more advice that you should visit Hanoi or Saigon. As my acknowledge that you will visit Vietnam at that time, I can say the cost of your Vietnam trip won’t be changed very much as half of your trip in high season and half in low season. However, 30 April and 1st May are Vietnamese public holiday, but I can say that your Vietnam trip won’t be affected. Everything will go as normally but you should expect some heavy traffic in Hanoi, Halong bay and Ho Chi Minh city. Please kindly have a look at my suggested Vietnam itinerary and let me know if you want to proceed or have any amendment so I can book the domestic flights, as this time of the year is one of the busiest time for domestic travellers so flights within Vietnam need to be booked well in advance. I hope it helps and look forward to hearing from you soon. Thank you for your patience as I try to coordinate plans. I am trying to confirm things with my travelling companion. May I check dates with you? We were planning to arrive in Hanoi one day before the tour, so would these dates work? Alernatively, might it be possible to do the Hanoi City Tour on Thu Apr 30 instead of Wed May 6, then perhaps we can catch a flight back on Wed May 6? What do you think? We have a little flexibility. If necessary, we could travel one day earlier, or if absolutely necessary, one day later. Finally, if my travelling companion cancels on me, is it possible to book a tour for a single person? I hope that doesn’t happen, but I thought I should check, just in case. Thank you for the mail. It is fine for you to start the tour one day earlier or one day later. Please inform me the flight time arrival and departure, so I can make perfect timing for the tour. If you start the city tour on the 30, your Halong bay trip will be the last and you will get to the airport around 15:10. Therefore, it would be helpful if I know your flight time. Surely, it is possible for a single person on the tour. We are finally settled. We will arrive in hanoi on Tuesday April 28 (tiger air from Singapore, arriving 15:30) Then the tour from April 29 to May 4. We will return on May 5 (tiger air at 16:20) This means we won't be rushed and will have a little extra time in Hanoi afterwards. Would you be able to book us a hotel for the April 28 before the tour and one on May 4 after the tour? What other information do you need from me? How do I go about payment? Can I check my reservations at Hanoi Silk Queen? 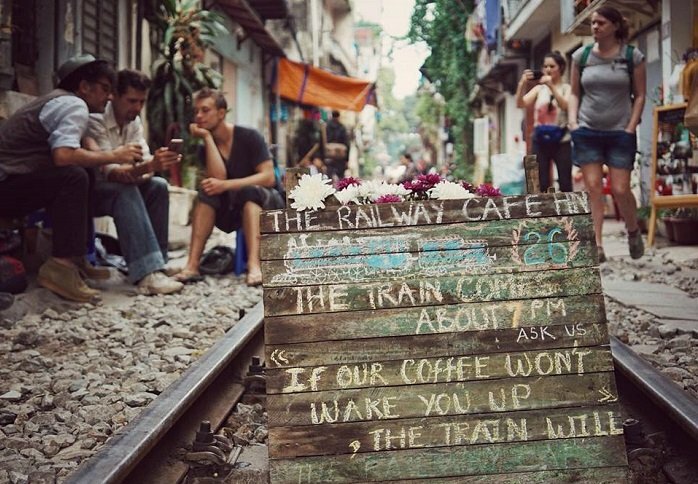 When we arrive in Hanoi, what do we do? Could you please tell me your flight number from Singapore to Hanoi on 28 April(it is still arriving at 15:30pm ) and the visa number? When you arrive in Hanoi, you will enjoy the street food tour Hanoi with your local tour guide and taste the most wonderful food. Yes, you can email the hotel or phone the hotel to check your room booked by Hai - travel advisor from Deluxe Vietnam Tour company. Please inform us that you need a double room or twin room as it will make you confortable. Kindly see the pick up board and the details of 7 day Vietnam tours Hanoi to Saigon itinerary in the attached files. Any further questions, please do not hesitate to contact us. My friend and I will arrive on tiger air TR2308 from Singapore on Tuesday, April 28 at 15:30. I have an approval letter from the government of Vietnam for permission to get a visa on arrival, but I don't have the number yet. My friend is from Singapore and does not need a visa. I do not know if we need anything more for our Vietnam journey. 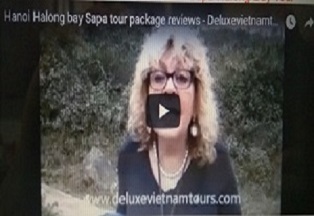 We are looking forward to amazing North Vietnam tours Hanoi to Halong bay and Tamcoc. We need a room with two beds.